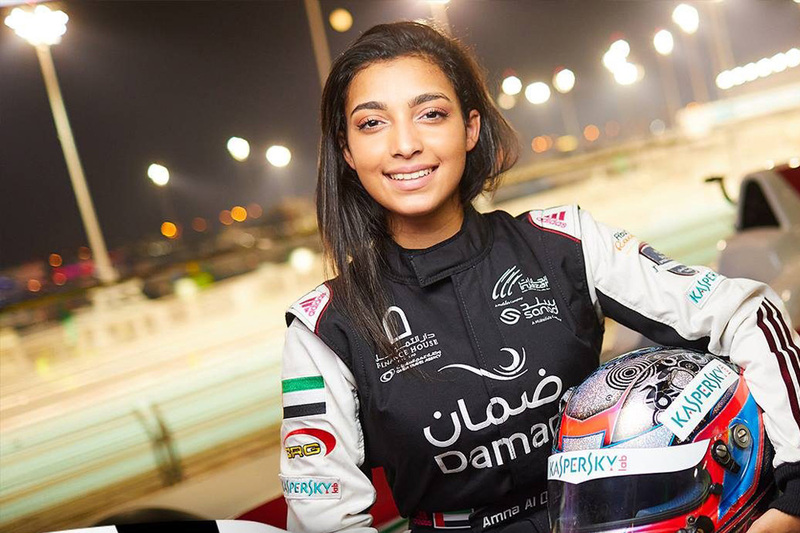 Amna Al Qubaisi is one focused and determined 18-year-old as the first Emirati female race car driver. Revered and adulated, the young athlete-turned-racer, who took a clean break from gymnastics in order to pursue motorsports, Amna hopes to participate in Formula 2 racing by the time she is 23 – and that’s not even her final destination. She told Harper’s Bazaar Arabia, “Formula 1 is the main goal, but it’s not an easy journey — and I’m determined enough to reach that,” as she spoke about Saudi Arabia’s Ad Diriyah Formula E event. Racing seems to be in Al Qubaisi’s blood as her father is Khaled Al Qubaisi, a Le Mans racing driver who has toured the world of motorsports. Speaking about her father, she says, “When he spoke about racing and how he did different tracks around the world, meeting new drivers – that moment sparked [something in me] and I wanted to try a kart.” Amna’s father gave her a kart and began coaching her – and she has shown no signs of slowing down, since.